According to Flood List: "A storm that swept across several parts of Sri Lanka between 20 and 21 May, 2018, caused flash floods in several areas, with Southern, Western and Sabaragamuwa Provinces the worst affected. Parts of North Western Province also recorded heavy rainfall. According to the country's Disaster Management Centre (DMC), 1 person died and 1 was injured in a landslide in Bulathkohupitiya, Kegalle in Sabaragamuwa Province on 20 May. The government said that in total at least 5 people have lost their lives as a result of landslides, wind damage and lightning strikes. DMC said that 13,314 people (3,438 families) in 12 districts were severely affected. 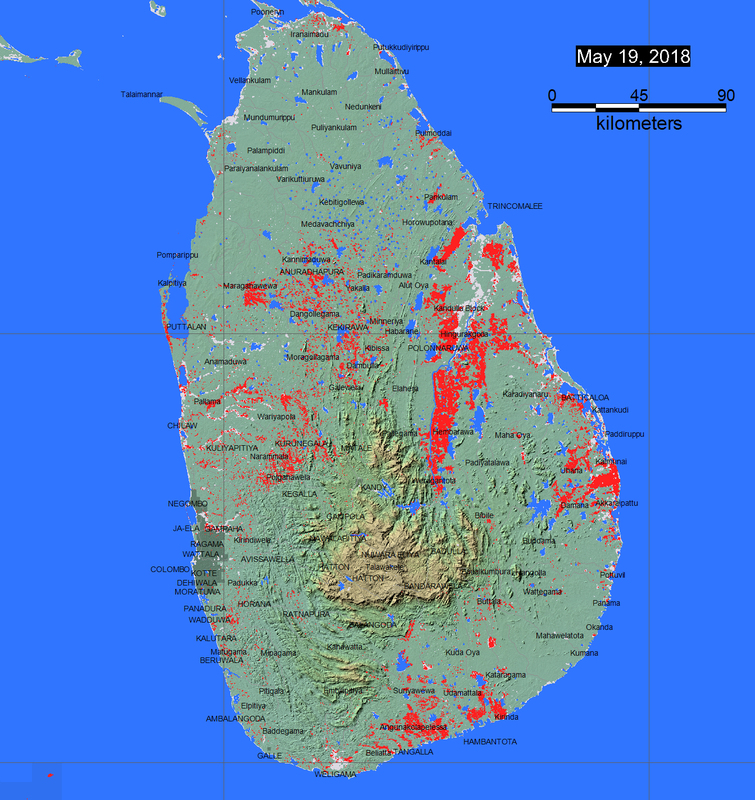 Sri Lanka's Department of Meteorology said that Anamaduwa, Puttalam, North Western Province recorded 353.8 mm of rain in 24 hours to early 21 May, 2018. At least 5 locations recorded more than 100 mm of rain in 5 hours during 20 May, including Ratnapura (Sabaragamuwa Province) which reported 222.5 mm and Eheliyagoda (Sabaragamuwa Province) with 201.5 mm. The department has warned of further heavy rain, with daily amounts of about 150 mm expected in some places in Sabaragamuwa, Western, Uva, Central Provinces and Galle and Matara districts in Southern Province"